I’ve fell out of love with radio a little. I used to tune in almost everyday when I was getting ready. But one thing that started to annoy me were the empty dragged out conversations, which is why now I turn to YouTube playlists and Soundcloud for my music fix. However, if what they talked about actually interested me, the long talks wouldn’t be so much of an issue. That’s where Filler Podcast comes in. 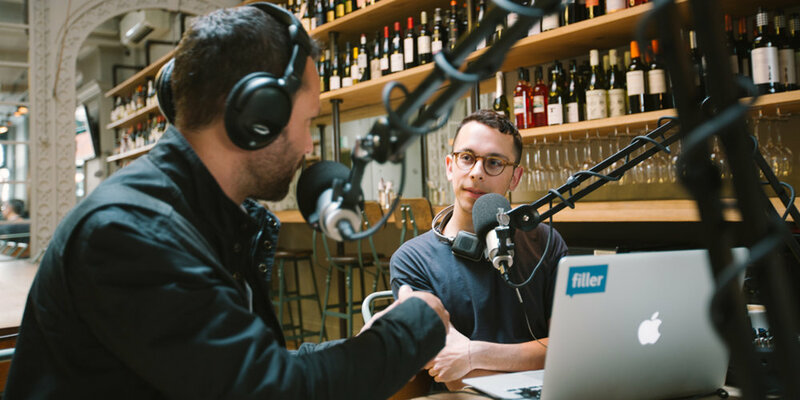 Created in just a month by two rather overly creative (if there is such a thing) guys Matt Shore and Harry Hitchens, Filler is a podcast that is released every Sunday and invites creatives from all industries to talk about their craft, drink coffee and chat about life. Only in their first series, they’ve managed to pull together a great range of speakers from content creators and writers to photographers and editors, notably opening up Filler with their mutual friend, Jack Harries, someone’s videos that I highly recommend you go and watch. Anyway I digress. The podcast takes place at Notes coffee over an almond milk cappuccino, a flat white and whatever the guest is having. Believing that the best conversations happen over a coffee – and after listening to the podcasts I have to agree – a coffee shop with the machines humming away in the background makes for a good listen. The podcasts can be anything up to an hour, but because of the topics of conversation, it goes by really quickly and I never find myself skipping through. What’s next for the podcast? Bigger and brighter guests, a wider community and to carry on inspiring. You can catch the last podcast of the series this evening (Sunday) at 6pm. We won’t have to wait around too long for the next collection of podcasts however, with an announcement happening on their social feeds next week. Go take a listen and get inspired.